PITTSBURGH, Pennsylvania, July 23, 2010 – A Pennsylvania abortionist whose repeated violations of state law prompted the health department to close down his facilities has managed to keep two of them in operation by transferring ownership to another entity; but the other two sites will cease performing abortions for good, reports Operation Rescue. The pro-life watchdog group says the Pennsylvania Health Department’s order for Dr. Steven Chase Brigham’s clinics represents a “partial victory for life” as Brigham’s facilities in Erie and State College are barred now from performing abortions. They are, however, permitted to remain open for other services. At the same time, Brigham successfully transferred ownership of his Pittsburgh and Allentown abortion clinics to Rose Health Services, an entity in which he has no controlling interest, in order to stave off their closure. Deputy Secretary of Health Robert Torres has banned Brigham, 53, and any corporation he controls from operating abortion clinics in Pennsylvania, because of his persistent infractions against state medical regulations. 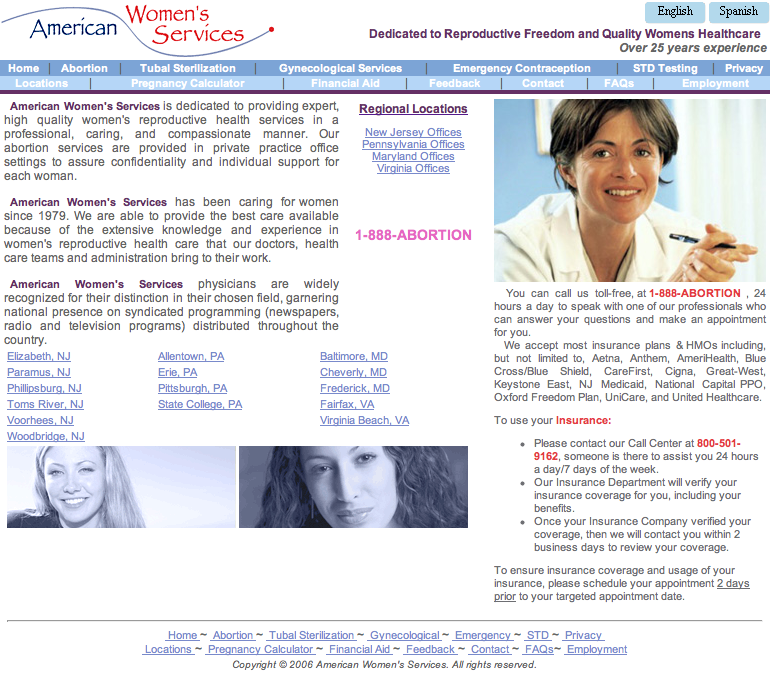 Brigham owns a chain of 15 abortion facilities with locations in Pennsylvania, New Jersey, Maryland, and Virginia. However the abortionist is licensed only to practice medicine in New Jersey. Brigham let his medical license lapse in Georgia, California, and was suspended permanently in Pennsylvania, Florida, and New York. Brigham was run out of New York after he performed two botched abortions in which state officials found him guilty in 1994 of “gross negligence” and “inexcusably bad judgment” that threatened the lives of his clients. New York also found him guilty of tax evasion in 1995. The Philadelphia Inquirer reported that Brigham’s offenses have been so egregious that even the National Abortion Federation (NAF) has disavowed him and applauded the PDH decision to shut him down. Brigham’s latest offense in Pennsylvania happened because he again was employing unlicensed medical staff to work in his abortion clinics. The Inquirer also reports that the Internal Revenue Service (IRS) is knocking on Brigham’s door, and has filed a tax lien against all his clinics for payment of $234,536 in unpaid payroll taxes for the years between 2002-2006. 1) How unbiased are we to post this? 2) Why do bother and stalk, and intimidate a women outside her home, she is not even an abortion doctor? 2. I hold a sign there. I wouldn’t call that stalking or intimidating. However, I’m sure she doesn’t like it, as I would not like it were I in the killing business. But I’m not and she is. Eventually killers and their enablers will realize that and get out themselves. I’m trying to hasten the process. then . . . How do you get them out? Unless you are intimidating them, otherwise why would they care? The fact is, they are intimidated, they are scared, because of the things you do and say and have done in the past and have associated yourself with in the past. The neighbors don’t want you, children are scared of you, I still think your best shot is the Dunkle Halloween costume. Move to Florida, retire from the harassment business. Hmmmm, sound familiar John Dunkle to your behavior? to others (That Jen is one example I guess). The only thing missing from the dictionary was your picture! You are what you are, NO WORD play on your part changes that, why not admit it, it is a bizarre puzzle you play. If that’s what it takes, why not tell people to accomplish your task? Otherwise why bother? Sounds like your kind are only successful when you harass, intimidate, bomb, terrorize, murder, send anthrax in mail, and scare someone enough. You worship Martyrs? Convicted murderers you fool sentenced to death, not Martyrs, you sound like a 9/11 terrorist the way you write. They will rot in hell for what they have done if there is one, as will you (if there was one). They are not martyrs, most of society thinks of them as the murdering scum they are -the Paul Hill’s and such that you would love as a son. On top of that overall you have had no success at all, you are a failure at your task that will naturally end as your SkyGod retires you (if you believe that stuff). R v W still stand when you are long dead. Women will continue to get abortions. no memory of you will last. And women will still have the right to abortion. You are a self perceived Ozymandeous of of anti abortionists. That is what is going to happen sullen John Dunkle. As a humanitarian, I do feel sad for your weakened mentation. Still, I’m willing to continue to listen to you, Elena. Today, 11:30 a.m. sharp, I’ll be at Sondra (not Sandra) Dantzic’s house, 598 Christopher Lane, Doylestown, PA. Meet you there. Sondra is an itinerant killer I’ve been visiting for a while now. Our “persuasion mission” continues from there to a few other places ending around 2 p.m. at Einstein Hospital in Philly. In addition to lecturing me, you may want to counter my message: “Dunkle’s wrong, Sondra doesn’t kill people, she kills kangaroos.” You know, stuff like that. Hope to see ya. What would you do, give her Rolaids? That’s in the the dunkle non intimidatative methods of “persuasion” handbook,” isn’t it? You evaded her questions, and played with words again. Did you ever take a course in college or write a paper, ie answered the questions the teacher asked, you must not have, as you would have been a failure as you don’t answer any questions. Then you are a failure in life. You are the sad sullen person that appears in your image. I would be very interested, John, in your giving us a report on today’s activities. While I applaud you for having the conviction to stand outside in the heat, I still seriously question if you are accomplishing anything. I think you know you are not, but going out and being a “celebrity” of sorts gives you some purpose. Otherwise, you’d be hanging around the house watching TV, right? I got to Sondra’s at 11:30 and walked the lane with my sign A KILLER LIVES HERE. Sondra lives in the last house on this dead-end (how appropriate). As I passed one of these dozen 2-million domiciles, I heard “HEY” loud and clear. I turned to see a neighbor pointing his camera at me, so I posed. Then a car turned the corner, saw me, and backed off. Five minutes later two cop cars arrived. As the officers did their usual thing, that car drove by and entered Sondra’s driveway. “That’s Sondra,” Gerry said, first time I’d seen her. Two other neighbors appeared, doing their lawn. I’d have to say that stop was successful. No success at Charles’s though. And the usual at Einstein. On the way to Einstein we always check on Tripp, but he’s hiding out in Jersey someplace. I don’t care what you say. “Horse-hockey” makes me forgive everything. Pat, it’s best to praise Dunkle for being a “committed Christian,” so that he doesn’t feel that in order to get society’s attention he will have to escalate his stalking to the level of homicide. I think though, that we’d get some clear warning signs of such escalation, however. John’s being a hero on the cheap– Aborticentrism points out that people who want to transcend the oblivion their death brings often strive to become a hero, because many heroes live on in human memory for centuries. The problem is, that society determines who will and who will not be a hero– Rimbaud left his poetry behind to become a gun runner in North Africa and died unknown. It was only later that his poetry caught fire with the world of letters, and now he is famous. So-called “pro-lifers” don’t want to take a chance at heroism; they want the certainty– so they solve the problem by SELLING society on a new definition of it– hating abortion. If Dunkle is able to just sell his subset of people on the nobility of his cause, he addresses his fear of death– but without risking his life, energy, or dicey psychological well-being! Smart man, but self-defeating in the bigger picture. “bigger picture”! What’s that, like heaven and hell? If someone were to dismember a newborn infant limb from limb until it ceased to exist, society would lock up that “monster” for life (or seek the death penalty). But if someone were to dismember a “fetus” (with heart pumping, senses “sensing”, spirit “filling”) at 26 weeks via a D&E – dismemberment of body parts, crushing of skull and fracturing of spine to aid in removal through the cervix), they would be “rewarded” with a check for $650 and could actually advertise for their “services” without a whimper from society. This is a vile and diabolical evil being perpetrated upon our children and we all have to choose a side. I choose to stand with John and the creator of life. And I will pray for all of you who choose to deny this abomination of epic proportions. It’s so simple a child could discern this – show a child the “truth” of this “procedure” and see if anyone could make the argument to them that this is “justifiable”. A normal human response to a video of such procedures is “gutteral” – the soul and body revulses as if succumbing to a poison. Those who don’t have become “numb” through desensitization (a phenomenon that also occurred in the death camps of Germany). David, I have proposed to one and all that the very core of the so-called “pro-life” movement is a fixation on death, as represented by abortion. A fixation that is so great that so-called “pro-lifers” cannot care for human life– and your master, John, has been a prime example of that. So, trotting out the Grand Guignol imagery masks the fact that while your ilk are so passionate about unborn life forms, they lose interest to a highly remarkable degree once the delivery room has been gained. So, rather than direct you to learn about aborticentrism and why for you the closer it gets to be your responsibility, the less sacred it becomes, I’d like you just to review for all here: How many children you have adopted; how many hours a week you do unpaid volunteer work in public schools, as a Big Brother, as a guardian ad litem, as a mentor; how many children you’ve foster parented, and whether you give 600 hours a year doing these things. And if you will, also tell us what percentage of your gross income do you expend directly on children whose parents cannot or will not care for them? In general, the so-called “pro-life” effort in the above is far less than “pro-choicer” efforts. If you don’t do the above, please explalin the gap between what you say about your care for human life and how little you actually care for it. The only death that I am fixated on is that of Jesus Christ, who died for our sins and is risen. These innocent ones who are slaughtered by the millions each year are not the ones who need our attention for they are with the Lord. It is the mothers, fathers, abortionists and us who are in need of mercy. “…Do not weep for me, but weep for yourselves and for your children” Luke 23:28. You are correct, I am a poor example for the “cause” and am a sinner of great proportions in what I have done and failed to do. What I am and have done is be a father to three teenage sons and a husband to my wife for 22 years of marriage. Over the last 10 years, I have been and am still an active coach, church member, Knights of Columbus officer/member, and more recently joined with a local CPC to offer my assistance. My wife and I have sponsored 5 children (currently 3 right now) through Compassion Intl. and spend about $150/month towards these needy children and their families. We give as much as we can (monies, prayers, time and effort) to various charities (not just the specific criteria you indicated) and have considered adoption but have not yet acted upon this (we will continue to pray for God’s guidance). As you rightly point out, it is not enough by any measure and I can only pray for the strength to persevere to greater depths of charity in the years to come. I am struck by the eerie comment you made referring to “unborn life forms”? REALLY? Sounds almost alien-like. I would argue with your comment on those of us who “lose interest to a highly remarkable degree”. Quite the contrary…having witnessed the miracle of birth on 3 occasions, I have come to value the preciousness of all life. And as a humble and often inadequate servant of the Lord, I will love my neighbor (friend, foe, unborn, born, young, elderly, rich, poor) until my dying breath. Oh – there’s that fixation on death, again (sorry). So, David, life is so precious to you than rather take on one more born child and raise it yourself to a fulfilling adulthood, you prefer to have it born to someone else and left to the fate awaiting it when it leaves the Baby Store (http://web.mac.com/charlesgregory/ABORTICENTRISM/The_Baby_Store.html) ? If limiting yourself to sacrificing for only three isn’t an example of “the closer it gets, the less sacred it becomes,” I don’t know what would be? Why are you so content to trust that others will provide for the next child what you won’t provide yourself? If you’re indeed putting 8% of your gross income indirectly (and not directly; how do you know 100% of the money is being used the way you say you’d want it to be?) toward the care of a child, your $150 a month indicates you’re only making about $22,500 a year. Which is quite a sacrifice if the only income you and your wife have is Social Security. But if she’s working at McDonald’s as many retired women do (for lack of a pension), then you’re right on the dot. Why wait for God to tell you to adopt? There are a lot of women out there He decided to make pregnant who don’t want to be. (I love His sense of humor; very dark.) That comes across like a cop-out. I know of one woman who has never protested at a clinic who is raising twelve adopted and fostered kids on her own with little more than the funding the state and the Feds provide– SSI for the handicapped one, Medicaid/CHIP, Food Stamps, food shelf thrift store, ANFC, foster stipends, you name it. She didn’t wait for God to come calling. But she’s only one woman. Here you are, a couple of better than average means (as I can read in your CV), using God as an excuse for not living what you preach to others, putting only as much time and money into your “good works” as you see fit. It doesn’t happen that way, as you should well know, when you have to raise a child. Don’t quote the Bible out of context– that was Jesus talking about the immediate future of the Jews. If you want to know what God said about abortion, it’s in Ecclesiastes IV, i-iii. And fetal life form is just that. It is humanoid, not human. It becomes human through interaction with other humans, and you’d better hope that they are good humans. Ted Bundy was born here in my state when his mother was put in the precursor of today’s CPC’s. It’s too bad you have so much anger that you discharge by venting about abortion, rather than addressing the underlying issues. The woman I spoke of is not an angry person at all. But you, with no children in the house, are. I look forward to any comments you have about the fates awaiting the children coming out of the Baby Store. In the time it took me to compose this, one child has been born who will start being raped by age 2. And you aren’t already there for her. I will pray for you sir – you sound like a very giving person but who wants to “create” humans through nurturing. God will provide for all of his creatures as he knows best and it is only for us to trust in him. We are far too imperfect to do very much on our own. The world is dark and falling under the control of the master of this world but Love will prevail in the end. Your own existence and the good you do each and every day is proof enough that God will provide even for these most vulnerable ones – it is not ours to second guess the creator but only to love all of these children as best as we can. God bless. “Loving all these children the best we can” has a lot to do with letting the woman decide how many children she is capable of caring for and nothing to do with fixating on fetal tissue. You have to confront the fact that your fixation on fetal life represents a danger to born children who will have even fewer resources with another sibling present. If on the other hand you decide to adopt one child, regardless of physical or mental incapacities, every year for the next eight years then you and your wife will have cared for as many as my parents had to, much against their inclination. You apparently didn’t read beyond the story of the Baby Store; if you had, you might have found out how aborticentrics have to conserve their energy, committing to their cause only as much as they feel comfortable, never truly sacrificing. Which is why you offer to pray for me rather than send money. Like their heroism, it’s saintliness on the cheap. The purchases I make are entirely based on these aricetls.